One of the cool things about the CSA (Community Sponsored Agriculture) that the Accidental Locavore joined this year is that you can pick out your own stuff. Depending on the size of your share, you can (for the past two weeks, anyway) pick five different items. For me, it becomes a veggie version of Chopped. What can I think of to do with bok choy or frisée or Chinese cabbage, etc? And more importantly, what works with whatever is in the fridge? 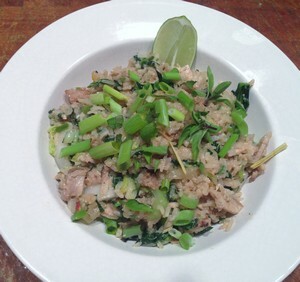 Last week, a bunch of Asian veggies inspired a Thai-styled fried rice with some of the leftover pork loin. This generously fed two and comes together really fast. The list of ingredients may look long, but it was just stuff I had – feel free to add or subtract as you wish. In a small bowl, mix the fish sauce, rice vinegar, chiles and brown sugar. Set aside. Have all your ingredients prepped and close to your stove. In a well-seasoned wok or large skillet heat the oil over high heat until almost smoking. Add the garlic and most of the scallions and cook, stirring constantly, about 30 seconds. Be careful not to burn the garlic. Add the bok choy and cook, stirring for about 1 minute. Add the Chinese cabbage and mint and cook, stirring for another minute. Add the pork, the rice and the egg and cook, stirring for another minute. 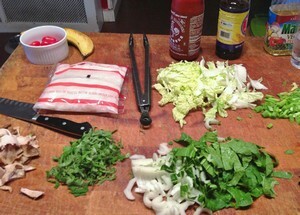 Finish by adding the fish sauce mixture, stir until combined and taste, adjusting the seasonings to your preferences. Garnish with the Thai basil, scallions and lime wedges. Serve at once and enjoy! My verdict: Not quite as good as my favorite Thai place (in of all places, Rancho Mirage, CA), but a really good first attempt. If I had some ginger and/or cilantro, I would have definitely added them, but I was trying to avoid a trip to the supermarket (and use up what was in the fridge). The Thai chiles are really hot, so be careful with them. Jalapenos or serranos would also work, or you could leave them out completely. If you wanted to make this with chicken or another protein, cut it into thin strips and add them in before the bok choy to cook properly (about 2-3 minutes). For successful stir-frying, make sure everything is prepped before you start cooking, have all the food cut to about the same shape and size and cook the things that require more time first.